Act4Advisors Addon for ACT! is a customized ACT! database template and program designed specifically for Financial Planners, Investment Advisors and Insurance Agents. With over 20 years of experience in the financial services industry combined with ACT’s contact management expertise, Allied Financial Software, Inc. has created a system that meets the client management needs of most financial professionals. Act4Advisors ‘adds on’ a financial services interface to the ACT! software. The customization includes pertinent industry features, such as personal information fields, basic account and insurance information, custom reports, web portal and document management with scanning capabilities. Our goal is to provide our customers efficient software, training and consulting while establishing partnerships with other acclaimed financial software companies. This goal enables us to deliver the most effective products and services to our customers. Personal data fields for your client’s and prospect's personal information including dates of birth, social security numbers, drivers license numbers, phone numbers, multiple address fields, hobbies, clubs, tax information, etc. New Business and Delivery, Seminar Planning and more. Q. What is the Act4Advisors Addon for ACT!? A. 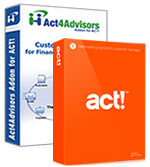 Created by Allied Financial Software, Inc. (AFS), Act4Advisors is a customized ACT! database, layouts, reports, queries and other plugin files designed specifically for financial services professionals who use the ACT! software. 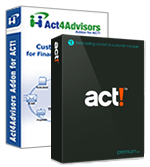 Act4Advisors eliminates the time needed to customize the ACT! database. Q. Why should I consider a contact management system? A. Contact management systems organize time and client data. Most advisors are inundated with data and they must be able retain and access information quickly and easily. Without easy and fast access to client and prospect data, an advisor may lose critical information eventually costing the advisor a lost sale, a lost client or a lost career. ACT! combined with the Act4Advisors add-on helps you manage relationships by managing data and processes. With ACT!, you can: Remind yourself to call a special client on his birthday. Send out a disclosure letter to a new prospect. Enter a time stamped note about a concern the client has regarding a particular type of investment. Keep a history of every meeting, call, letter, email and task you have completed for the contact. Attach any electronic document to the contact for easy retrieval. Delegate a task to your assistant to send a welcome package to a new client and find out if and when it was sent. Keep in constant contact with your best clients and prospects. Contact Management Systems will help you better organize your current system of managing contact/relationships helping your business grow and flourish. Q. I already use ACT! but why should I consider Act4Advisors? A. When you purchase ACT!, the basic ACT! database comes with only a few predefined fields that allow you to keep track of names, addresses, phone numbers and email address. To add or modify data fields and the layouts, the software requires customization. This customization demands extensive knowledge and time… time that most advisors don’t have to spare. Act4Advisors IS an ACT! database but it includes over 400 data fields specific to the financial professional’s practice. Fields added include contact, spouse and children information such as dates of birth and social security numbers, fields for account numbers and account registrations, insurance policies, net worth, securities held, suitability information and much more. Because Act4Advisors is used by thousands of other financial services professionals, it has become a “standardized” ACT! database. This allows us (or anyone else) to create interfaces to third party software programs and platforms. Without a standardized database, interfaces can only be written individually for each user’s database. This keeps industry platforms from interfacing with your ACT!. Q. Can I import my existing data into Act4Advisors? ACT! has an import wizard allowing the importing of data from several sources. The existing data can be other ACT! databases, Comma or Tab delimited text files (ASCII), Microsoft Outlook, Palm Desktop and dBase III-V. Importing from another ACT! database will bring in all of your old notes, histories, activities, groups and any other data you have that can be “mapped” to the Act4Advisors fields. If you are using another database program, we may be able to import your data for an additional fee. As ACT! Certified Consultants, Allied Financial Software, Inc. can also import data from other third party programs such as Goldmine, dbCAMS+, EZ Data’s Client Data System and SmartOffice, FDP’s Contact Partner, Junxure, Brokers Helper, Brokers Ally and many more. Contact us at 800.831.7636 for more information or fill out a request form. Q. Can I customize Act4Advisors? A. YES. Since Act4Advisors IS an ACT! database, you can add your own customization. Also, Act4Advisors is compatible with most other ACT! add-ons giving you even more functionality and extensibility options. Q. Can ACT! work with my PDA? A. Yes. ACT! has built in integration with Windows Mobile Devices and Palm devices. Alternately, you can purchase an add-on program to interface ACT! to your Blackberry device or iPhone. Synchronization with these add-ons is available via both wired and internet sync. Q. I often travel and am away from the office without internet connection. How can I access my database? A. ACT! includes a feature for database synchronization. When you leave the office, your database on your laptop can record changes. When you are back in the office, you can synchronize your laptop database with the main database. Changes made to either database will merge into both. Q. We have remote offices. How can we all share database? A. There are several options for remote users including synchronization; remote access programs such as Gotomypc, Remote Desktop or you can alternately license a web version of ACT! Q. What is the Act4Advisors' support policy? A. Allied Financial Software, Inc. currently offers free telephone support for 30 days after purchase for installation issues only. After 30 days up to 12 months, any support issues that are sent to us via email or web site will incur no charge. After 30 days from purchase, telephone support is optionally offered under two options: Per Incident Support or Annual Support. Click here for more complete details on Act4Advisors' support policy > All support options allow us to connect to your computer (only with your approval of course). Remote access allows us to see your computer’s desktop and move your mouse. This saves you time and allows us to resolve issues quickly. Q. What is the return policy for Act4Advisors? Q. What are the system requirements for Act4Advisors? A. Since ACT! is the underlying program, Act4Advisors will follow Sage Software’s requirements for the version of ACT! you are using. Click here for ACT! 2009 System Requirements > We do recommend higher requirements for a better computing experience. ACT! 2009 and greater will work on Windows XP Home or Professional 32bit, Windows Vista 32 or 64bit, or Windows7 32 or 64bit. For workstations, we recommend Windows XP 32bit running a Pentium 4 2ghz processor or greater with at least 1GB of RAM. For Windows Vista workstations, we recommend 32bit and at least 2GB of RAM Servers running Windows Server 2003 or 2008 are supported. Q. What other software does ACT! work with? A. ACT! 2009 and 2010 works with MS Office 2003 and 2007. ACT! 2011 works with MS Office 2010. It allows integration with MS Word, MS Excel and MS Outlook. *Act4Advisors License Note: Each Act4Advisors license includes one Act4Advisors database that can be installed on one computer. The license level is based on the number of active users who have login rights to the database. License level’s include Single User, 2 User, 3-5 User, 6-10 User, etc. Note: ACT! Pro (Standard version) can only be used with up to 10 users sharing one database. If customer adds an 11th user or greater, ALL users must upgrade to the ACT! Premium. **Requires previous version of ACT! and Act4Advisors. Customized ACT! for Financial Services Professionals. ACT! not included. Note: Online orders are available for US residents only. Canada and International sales please call 1.770.475.0495 x1 or email sales@software4advisors.com for purchasing assistance Monday - Friday 9AM - 6PM EDT. Note: To purchase this, you must have purchased a previous version of Act4Advisors (Act4Advisors version 1 or 2). ACT! not included. The products and services highligted on the softwar4advisors.com website have undergone a product review by Allied Financial Software, Inc (AFS). AFS are resellers of most products listed on this website and are in no way liable or responsible for claims made related to the products or services provided by third party vendors. AFS does not warrant or guarantee the quality of products or services provided by the vendors. Please direct your inquiries regarding softwar4advisors.com website product warranties to the appropriate vendor. 1. You must purchase one license of Act4Advisors per user. 2. You must purchase one license of Scan&Organize Addon for ACT! per user. 3. Scan&Organize Addon for ACT! requires a TWAIN Compliant Scanner. 4. Published minimum system requirements are based on single user environments. Actual scalability and number of networked users supported will vary based on hardware and size and usage of your database. Sage Software scalability recommendations are based on in-house performance tests using the recommended server system requirements found at: ACT! Requirements to ensure your system meets these requirements. You must have one license of ACT! per user. **Note: ACT! Pro (standard version) allows 10 or fewer users. If you expect to have more than 10 users, you must purchase ACT! Premium. This version allows more than 10 users and gives you additional functionality. Click here for more a comparison of standard to Premium. Important Note for ACT! 6.x or Prior Customers: Customer activation and registration are required to use ACT!. Certain features may have changed or are no longer available, including inbound caller ID functionality, WinFax integration, recording and playback of macros, email/modem-based database synchronization, and SideACT!. Act4Advisors 2.0 - Customized Contact, Client and Office Management for Financial Advisors. “Frequent contact with customers, or "relationship management," is important in building a successful business. The payback is clear: Retaining current customers costs five to seven times less than finding new ones. Studies show that over a lifetime, loyal customers purchase more, cost less to sell to, and will refer five other people to a business.” Author: Mangala Jagadeesan ~ TICKER Magazine See the Article [PDF Format]» Investment professionals that use the widely acclaimed ACT! software know the power and advantages it brings to their financial practice. With over 3 million users worldwide and 10,000 corporate accounts, ACT! has proven itself by bringing ease of use and powerful features that even a novice can master in just a few minutes. But, to get the most out of ACT!, it is important that users customize the ACT! interface for easy access to the data they need to keep track of. “If ACT! is such a great product, why do you need ACT4Advisors? The answer is simple: ACT! is designed for general sales, not specifically for the financial-services industry. It is possible to customize ACT! to meet the needs of financial advisors, but to do so would be time consuming. Wouldn't you be better off purchasing a set of industry specific layouts, templates, and reports that were already customized for advisors? Well, that is exactly what ACT4Advisors offers.” Author: Joel P. Bruckenstein ~ Morningstar Advisor See the Article » Most ACT! users never have the time nor the expertise to customize their ACT! program. As a result, they never get the full power of what ACT! can do for them and their business. They miss opportunities and that means loss of revenue or worse yet LOST OPPORTUNITIES.